Personal Power is a month-long transformation program by Tony Robbins. The idea is that you listen to a recording per day and take action as instructed. It’s fabulous. Ton Robbins says we have to believe that we can change right now. Another two ideas to get leverage is to make a public commitment that you’re going to change (what Charles de Gaulle did to stop smoking) and personal integrity (ask yourself how your current sub-standard behavior is inconsistent with who you are. Change it abruptly and make it as conspicuous as possible. If you can manage to ashame yourself too in the process of changing the pattern you will not only interrupt the patter, but also get leverage at the same time. Ideally you replace with something that gives yo the same pleasurable feeling without the negative effects. Or something that gives you even more pleasure. My note: I don’t think “I’m the best” is any good for you, but just to give you an idea of a typical incantation. My Note: in The Talent Code returning Iraqi soldiers suffering from PTSD are given the same stimuli they had in war zones and they are conditioned to stay unreactive. And if you feel you need help socially check my free Social Mastery Guide. He says he’s done every day, day after day, by doing things that would increase his physical ability changing the way hes moves and breathes. Ton Robbins says a great way to focus on positive endeavors, is by asking question. While alrady mentioned in the state section, questions are one of the 5 “master systems’ in Tony’s approach. Change the way you move to feel empowered and in confident. Change your breathing and you facial expressions. How do yo speak when you’re happy, when you’re euphoric, when you’re on top of the world? Value are built from beliefs, which are built from references (more on that below). Ask what values you need to eliminate. Tony Robbins for example found out that by constantly focusing on being free he was missing out on the freedom he already had. So he dropped freedom from the list and consciously decided not to make it an issue anymore. And suddenly it was amazing the freedom he by dropping it out from the list. My Note: I did the exact same with freedom. Freedom was such a big thing for me I felt suffering any time I was doing something that negated my freedom. Helping a friend? That’s not freedom! Keeping an appointment? Damn, where’s my freedom! I dropped the freedom-trap by reminding myself that I AM free. I CAN do whatever I want. I always choose what I’m doing. Being a free man in a free world, freedom is NOT your issue. Also what you place higher up means you give it more important, so ask yourself how the placement will affect your life. For example ask: how would your capacity to deal with fear, frustration and rejection be affected by placing “courage” high upon your move towards value? One more note: Brian Tracey adds that our happiness and self esteem is heavily dependent on how closely we live to our values. Our self esteem is tied to our ideal self, such as the person we want to be, and the way you see yourself at the present time. Unsuccessful people have no values or sacrifice values for short term gains. You gotta stay true to your values if they are to shape you in any significant way. Brene Brown says that when we see our leaders not live up to the professed values, we disengage. They are generalization you’ve set up for yourself about what has to happen to experience a certain results in your life. They often are in the form of “if… then” statements. A rules is disempowering if it’s impossible to meet, if it’s outside of your control, or if it gives you only a few ways to feel good and lots of ways to feel bad. Example: Tony was in a resotr having high expectations for the eclipses which was going to happen. But clouds gathered and it was a huge let down for everyone. But Tony decided he would enjoy his time anyway in spite of clouds. It was possible because had decided that “no matter what happened, we’d find a way to enjoy it”. My Note: But beliefs can often trump the body. An experiment allowed a mouse to win fights against bigger opponents by drugging the opponent. Then he was pitched against bigger NON drugged opponents. The smaller mouse trashed the bigger opponents. Let’s say you wanted to get good with people, and you wanted to adopt the belief, “I can learn to get better with and understand people.” You’d build that up out of all of the references you have in the past for talking well to people, how many guides there are for talking to people, and how great it would feel to finally handle this area of your life. Then, look for the antithesis you’re feeling right now, that you’re terrible with people and you’ll never get better. Find as many references that run counter to it, like how you can at least talk to store clerks or make small talk with people, how some people with backgrounds of being shy have evolved to socialites, and imagine finally shaking off this negative label for yourself. Then, associate massive pain to it with the techniques listed above. When it becomes too painful to not adopt the belief and too enticing to hold back from adopting it, you’re now motivated enough to take action towards building this idea into a full-blown belief and you’ll find ways to get experience with talking to people: you’d read guides, talk to strangers, figure out what works and what doesn’t, and keep focusing until the changes stick. This is also very well explained in Ryan Holiday’s masterpiece The Obstacle is The Way. My Note: getting busy to “crow out” worry is NOT a good strategy as that only covers up the issue, as well explained by Brene Brown in his seminal book Daring Greatly. Tony Robbins says that an easy way of dealing with procrastrination is, well, to procrastrinate it. Put it off. Tony Robbins says that you are anchoring every time. Any time you are in an intense emotional state, anything that happens around you consistently while you’re in that state gets associate to that feeling. My Note: I second and confirm that from first hand experience. 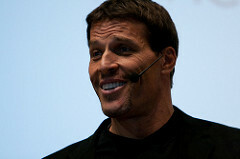 Tony Robbins advises to picture yourself about to start the behavior you want to chance (play with your hair, crack your fingers, get weak in the presence of your boss), then create a picture of yourself as the guy you want to be, your ultimate self (confident, great communication, charming, drawing people in, a picture of success). My Note: I didn’t find the steps or what Tony Robbins said here to be particularly useful to be honest. This was before he wrote his money Master the Game and interviewed true experts like Ray Dalio. He said things like “you can increase your return without increasing your risk”, which makes little sense. What Tony did with that man who was hurting himself was to made him realize that what he was getting wasn’t real love, but obligation. And people were actually hating him for that (he is linking pain to his previous pattern). This lowered his own emotional intensity and conveys that you have fait in that person’s ability. -to a woman who said she had baggages Tony said: what if you dropped the baggage. It’s a great idea to re-evaluate your life ever 6 months or year. Every day care deeply, create something new, cooperate with ppl on how to make a difference, commit to being the best and contribute. The dreams of your past will become small confronted to what you will have. “What a folly to dread the thought of throwing away life at once, yet having no regard by throwing it away by parcels and piecemeals”. It’s been a while I listened to it, but Tony talks about the law of attraction with an example of a couple who won the lottery, twice in a row, by acting as if they had already won it. That’s stuff that I don’t approve of and I would not recommend anyone to follow that path -either the blind belief in the law of attraction or focusing on winning the lottery instead of making through skills and dedication-. Personal Power 2 is a masterpiece. You will feel energized like you’ve never felt before at the end of the month. But motivation for motivation’s sake has little use. That’s not an issue for this course though, because the content is simply superb. If you liked this summary, also check all my other summaries. Amazing, great job witht his site, amazingly helpful! Gracias Ricardo (just guessing Spanish origins here :), cheers! Thank you for this superb review! It is so structured and detailed that even having the course I’ll save it for later. Thank you Yakov, I’m glad it was helpful, cheers!